The Non Governmental Organisations’ Coordinating Council (NGOCC) says the only good thing in the 2015 PF budget is the theme; ‘Celebrating our Golden Jubilee as One Zambia One Nation by making Economic Independence a reality for all’. In a detailed analysis, the NGOCC says the provisions in the 2015 National Budget do not reflect the implication of the theme. NGOCC director Engwase Mwale says ‘the 2015 National budget is gender blind in that it does not adequately focus on programmes that address gender inequalities and assure economic independence especially with regard to women and children’. Mwale said NGOCC was expecting the government to zero rate Value Added Tax (VAT) in the 2015 national budget on essential food items including maize meal, sugar, milk, cooking oil, bread, beef, salt and baby formulae to mention but just a few. ‘Further, we expected the government to increase the Income Tax free threshold from the current K3, 000 to K4, 000 to enable most of the working poor meet their basic needs. We observe that both taxes have remained the same implying that the disposable income of the working poor will be reduced even further taking into consideration inflation,’ she complained. Mwale further said the NGOCC is saddened that in the 2015 budget, the government has still failed to introduce the Windfall Tax on the mines in order to broaden the tax base. The NGOCC also observed that the 2015 National Budget allocation to the Health sector of 9.6 percent falls short of the Abuja declaration of 15 percent total budget allocation to the sector. ‘In addition, we are concerned that the dwindling allocations to the sector will not address the prevailing high maternal and child mortality rates therefore not realizing Millennium Development Goal (MDG) target of 162 deaths per 100,000 live births. However, while we commend government for the move to upgrade the existing hospitals, University Teaching Hospital, Livingstone, Kitwe and Ndola general hospitals, it is our expectation that the specialized equipment in these hospitals should address the maternal and infant health problems including PMTCT, cervical and breast cancer, as well as under five services,’ said NGOCC director Mwale. The NGOCC is also disappointed by the failure by the PF regime to put enough money for the constitution making process. 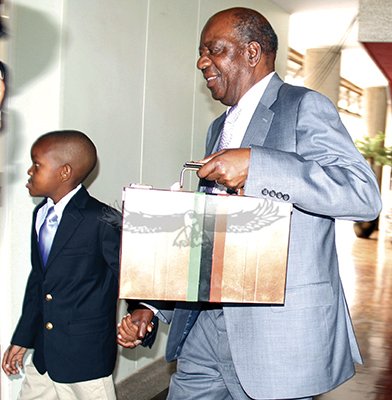 ‘The 2015 national budget has allocated only K29.26 million (reduced from the K44 million allocated in the 2014 budget, which still remains unexplained on its application) to the constitution making process with the assertion that it will cater for consensus building albeit unclear on its intended outcome. ‘We are of the view that the amount allocated to this important undertaking is not enough for a National Referendum as a way to adopt a people driven constitution and foster unity in the process. There is need for magnanimity on the part of government to facilitate well-meaning consensus building with regard to the constitution making process by immediately releasing the final draft constitution and accord citizens an opportunity to engage positively with the document and process. ‘NGOCC still contends that a people driven constitution will provide a legal framework that will be used for achieving an all inclusive growth and equal opportunities for all. The inadequate allocation shows the lack of political will on the part of government to give the Zambian people a constitution that will stand the test of time,’ Mwale asserted.